Family affair: Corporal Herb Drees, (ret. ), a Korean War veteran, helped pin insignia on grandson Phillip Ramirez while his wife placed an officer’s hat on the new ensign’s head as a proud mother watches. Major Esteban Ramirez, (ret. 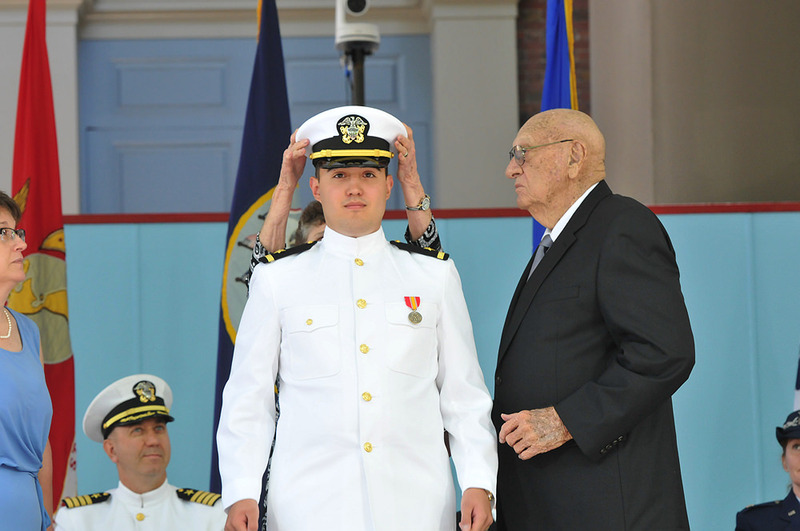 ), administered the oath of office to his son, and Patrick Ramirez ’20, a midshipman second-class in the Harvard ROTC unit, rendered his brother his first salute. 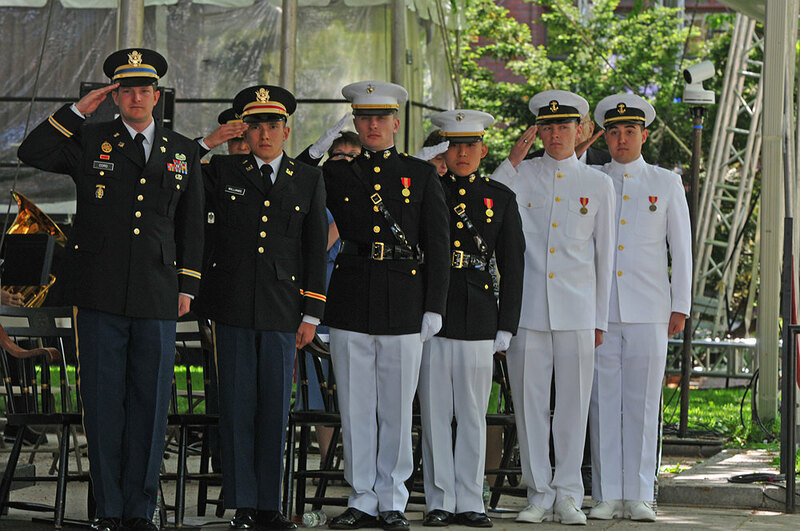 Read the commissioning ceremony program. Second Lieutenants Kevin Zhu ’18, of Boston, a visual and environmental studies concentrator, and James Joyce ’18, of Milton, Massachusetts, an economics concentrator with a citation in French, who will both attend the Marine Corps Basic School in Quantico, Virginia. Ensign Kirstin Anderson ’18, of Virginia Beach, Virginia, a physics concentrator with a minor in East Asian studies and a citation in Chinese, received her commission earlier. A varsity sailor, she is competing with her teammates at the ICSA Women’s National Championship in Norfolk, Virginia this week. She has been selected for submarine duty and will join the Naval Nuclear Power Training Command after initial training. I have believed it is imperative that Harvard and the military maintain a close relationship. Military service and sacrifice are an important part of this university’s history—going back even before George Washington and his troops bivouacked on the hill just behind us and used my office as a soldiers’ hospital. But more significantly, strong connections between Harvard and our armed forces are essential to Harvard’s—and the nation’s—present and future. Harvard students aspiring to be leaders and influencers in America and the world need to understand the military. And the military has and will continue to benefit from the contributions of the extraordinary leaders educated here. Following the 2010 repeal of “don’t ask, don’t tell” restrictions on gay Americans serving in the military, Faust fostered efforts to restore ROTC programs to Harvard after almost 40 years of formal separation, an undertaking that led to an initial agreement in March 2011 for the navy’s program to return to campus; agreements with other branches of the service followed. President Faust delivers her remarks at Wednesday morning’s commissioning ceremony. The guest speaker, former U.S. Secretary of Defense Ash Carter, and ROTC staff members are at right. We honor you and all those who have preceded you. Guest speaker Ash Carter, U.S. Secretary of Defense from 2015 to 2017 and now returned to the Harvard Kennedy School as director of the Belfer Center for Science and Technology, gave his audience a tutorial, initially discussing current security challenges—military, economic, and technological—whether from nation-states like Russia, Iran, China, and North Korea, or entities such as ISIS. He told the officer candidates to be warrior-diplomats—diplomacy must be tried before force—but asserted also that there are some foes diplomacy cannot reach. Fireman First Class Robert E. Haley, a World War II Navy veteran of the Normandy invasion and a recipient of the Legion of Honor, rendered his grandson, Ensign Michael Haley, his first salute. Captain Paul Haley ’76 (USN ret.) administered the oath of office to his son.